Throughout the 1500s and 1600s AD, the Blackfoot continued to live in the same way they had lived before 1500. But the lives of Blackfoot people changed a lot in about 1730 AD, when they got horses from other North American tribes. Once they had horses, they could hunt bison and get their food more easily than from farming or gathering. They also got guns in trade about the same time. Also, white settlers were pushing the Sioux further west, and the Sioux were crowding out the Cree, the Crow, and the Blackfoot. Soon, like the Cree and the Crow, the Blackfoot abandoned their land near the Great Lakes and traveled west to the Great Plains to hunt bison full-time. By 1800, the Blackfoot nation controlled a lot of north-western North America (the modern provinces of Saskatchewan and Alberta in Canada, and the modern state of Montana in the United States). This was a lot of land, and the Blackfoot nation was powerful and successful. 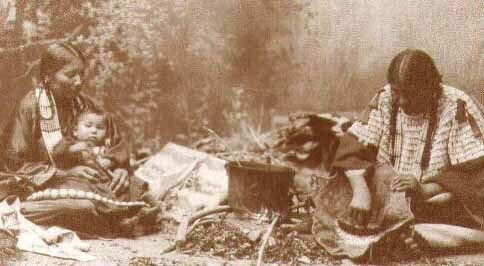 In this period, Blackfoot people were nomads. In the summer, they followed the bison and hunted them for most of their food. They traveled in small bands of just a few families. If people weren’t getting along, they just changed their band. In the long, cold winter (almost half the year), people settled down in winter camps and didn’t move again until spring. The Blackfoot were always fighting wars to defend their own land or to get more of somebody else’s land. They fought often with the Cree and the Sioux to their east and the Crow to their south. These wars, combined with frequent epidemics of smallpox beginning in 1780, killed many people by the late 1800s. In the summer, the whole Blackfoot nation got together for the Sun Dance ceremony, which brought them together as a people. Then in the fall there were big bison hunts to get enough meat to last, dried or made into pemmican, for the winter. Because the Blackfoot were so far away from where the Spanish, English, and French invaders were, they were able to keep on living their normal lives, hunting the bison, until the 1880s AD. But as with the Sioux, the horses ate the food that the bison needed in the long cold northern winters, and the more horses the Blackfoot had, the fewer bison survived. By 1881, European settlers and the United States and Canadian armies worked together to deliberately kill most of the remaining bison in order to force the Blackfoot people onto reservations. The United States army forced the Blackfoot people who were in Montana to move on to a reservation. The Canadian army forced the Blackfoot people who were in Canada to move on to reservations in southern Alberta. Many people died during the late 1800s and early 1900s of diseases like measles and smallpox that they caught from the Europeans. They struggled to figure out how to live without the bison. Eventually most people turned to either farming or ranching (raising cattle), and there started to be more Blackfoot people again. Today, many Blackfoot people work for a successful pencil and pen company they started, but the tribe also makes money by leasing oil and gas rights and leasing land for cattle grazing. Cite this page: Carr, K.E. 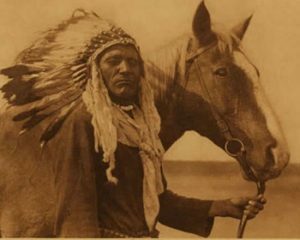 Blackfoot get horses – American history. Quatr.us Study Guides, August 12, 2017. Web. April 21, 2019.